Throughout my personal journey as female adventurer, there have been many moments of both empowerment and doubt. Am I really putting myself out there? Is my story something people really want to hear? Does this one-woman trek through life and the outdoors truly matter? Sometimes, the questioning is relentless – but every once in a while, there comes a moment that confirms to me that yes, it’s all worth it. 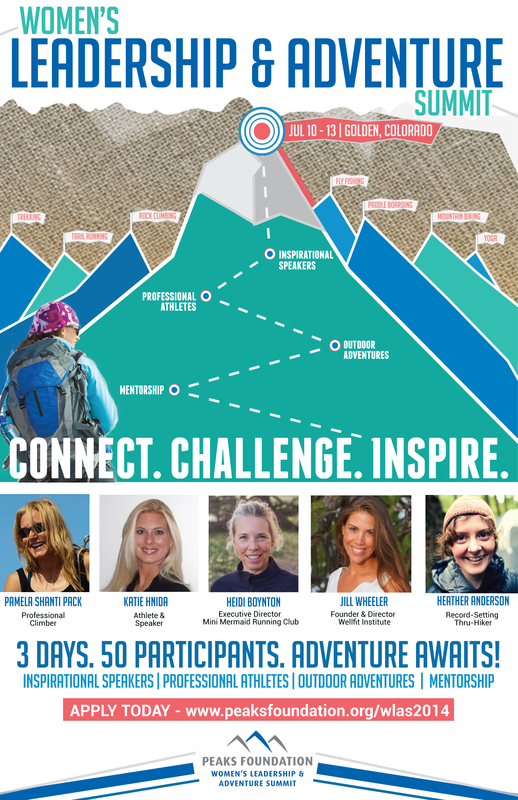 I am beyond proud to announce that I was asked by the Peaks Foundation to be a speaker at their annual Women’s Leadership and Adventure Summit conference in Golden, CO on July 10-13th! 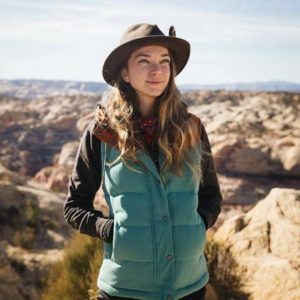 The WLAS ’14 event is an incredible weekend designed to bring 50 women together for three days of personally challenging adventure activities, engaging speaking sessions from 9 successful outdoor women, and building inspired connections with fellow females who seek adventures beyond four walls. There will be yoga in the mornings, cocktails in the evenings, and a jam-packed schedule that offers women a chance to experience their choice of climbing, trekking, fly-fishing, paddle-boarding, slacklining, and more. Applications have officially opened for WLAS ’14, and I would love to see some of my readers at the event. Women are invited to apply now through June 1st, but only 50 women will be accepted to the summit – so APPLY NOW! Follow, like, share, spread the love! My childhood was built on bike rides through mangroves, picnics beneath an old limestone fort, sandy sunning along a coast inlet, and boating excursions – all enjoyed at Matheson Hammock Park & Marina. One of the outdoor staples residents of ritzy South Florida, this slice of nature offers an escape from the surrounding mansions and 5 o’clock traffic jams along Old Cutler. For now. 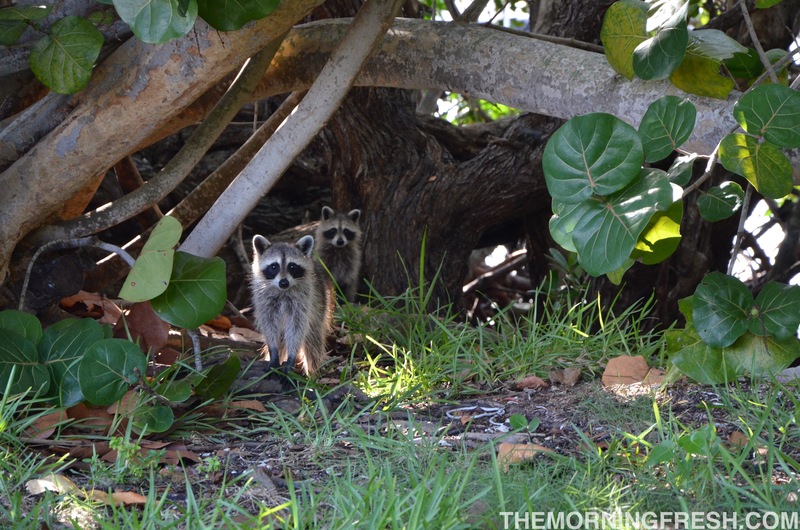 The sanctutary (for humans and wildlife alike) at Matheson Hammock is gravely endangered. It recently came to light that Miami-Dade County awarded a private company the rights to construct an enormous 5-story boat warehouse in the park – and the folks who cherish Matheson simply won’t have it. Obviously thinking with their calculators instead of their souls, the county selfishly allowed for a potentially disastrous edifice to be built. Why is this boat warehouse such a horrible idea? Well aside from the giant eyesore that will forever change the skyline, this facility will have a monstrous impact on the community and park. The once peaceful destination will become crowded with traffic to and from the storage warehouse, and if you’ve ever taken a drive down Old Cutler at rush hour, you know how torturous congestion is on those roads. Not to mention the noise pollution, the potential for run-off and introducing harmful chemicals into a delicate ecosystem. As a park enthusiast, I am outraged by the idea of my beautiful mangrove landscapes becoming defaced by a looming structure, and I am livid at the thought of my favorite raccoon family slurping on water tainted by the extra pollution introduced by the warehouse and extra flock of boats within. As a boater, I can’t even fathom the idea of the marina becoming any more crowded than it already is on any given sunny morning. I have to wonder if those in favor of this storage facility have ever been to the park on a warm Saturday – do they really think there is capacity for more people/boats? 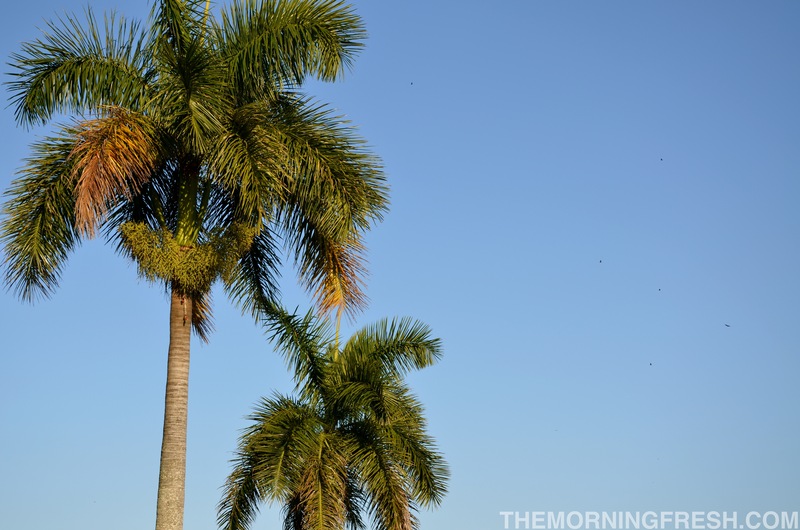 So what can you do to save Matheson Hammock Park? First, and foremost, you can sign the petition against the boat warehouse. Then, you can share it with all your friends. While the City of Coral Gables is infamous for making any home renovation permits a nightmare, it’s also well-known for it’s excellent history of listening to the people. Unlike the county, the city is truly concerned for the welfare and well-being of its residents. Contact the City of Coral Gables, and let them know how you feel about the future of Matheson Hammock. Still not convinced? Check out this blog for ten photographic reasons to save Matheson Hammock. 5 Ways to Celebrate La Madre Tierra for Earth Day! Looking for a way to pay homage to the beautiful planet that so kindly houses you, feeds you, waters you and creates boulder formations for you to climb? – Consider one of these five ways to say ‘thanks’ to nature on Earth Day. 1. 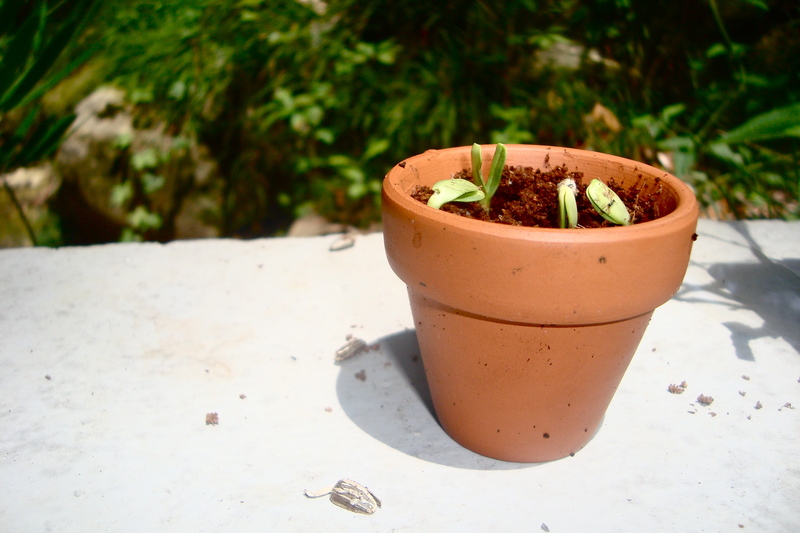 Plant something. The possibilities here are really endless. Plant a tree, take a cue from my neighbor and plant some dainty flowers, or get creative. Eatin’ a pineapple or avocado? You can plant ’em! I currently have a pineapple head and a sprouting avocado pit basking in the sunshine on my patio. Good for the earth, and an entertaining little project. Stick a few tooth picks into the pit, prop it up in a little cup and fill it with water until the base is nicely situated in liquid. Voila! 2. Feed the critters! It is no secret that I am obsessed with my little creature buddies. Birds, squirrels, raccoons – I love ’em all. Making bird-feeders is a quick and fun way to celebrate Earth Day. Check out my how-to make a bird feeder using recycled products, or go old school with a simple feeder made by rolling pine cones in peanut butter. Hang it by your window and you’ll have entertainment all day long, like the time the Squirrel Bandit parkoured his way up to my feeder..
3. Pick up some trash. There is no shortage of litter in this world, and there’s no better day to tote a plastic bag around and fill it with the rude garbage that clutters the earth. I’ll be collecting trash around Tally Rock Gym today after I volunteer a belay party, so feel free to come join me. 4. Thank your farmers. Not exactly thanking nature, but today is a great day to appreciate the people that work hand-in-hand with the earth on a daily basis. Forgo the mass produced food that is processed using methods that create pollution and waste – stop by a farmers market (like the Thomasville Farmers Market, or the Pinecrest Farmers Market) or local grocer, and take a bite out of something good for your body, and good for your earth. 5. Take a hike! Or leisurely walk, or bike ride, or canoe ride. Get outside and revel in everything that the earth has provided for you. We spend too much time taking advantage of our resources, and not enough time appreciating our blessings. Head to a local park, make a drive to your favorite beach, canoe along a river – the ways to cherish the outdoors are endless, so stop making excuses. Did I mention that these things are great activities for ANY day, not just Earth Day? This holiday aims to raise awareness about our need to give back to the earth, but you efforts to celebrate Mother Nature shouldn’t be reserved solely for April 22nd. Every day presents a prime opportunity to make a difference. It’s time to go local, and you should to! Support local businesses to support your community. I’ll admit, pinching pennies at Walmart has been a budgeting tactic of mine for the past four years. It’s simply too easy to save money at Wally World, but the time has come to ditch my selfish habits. Yes, shopping locally doesn’t always bring the deep discounts presented by big corporations like Walmart, but spending a few extra bucks on groceries will benefit my community and my health. Do you really think that Walmart is concerned about the quality of their produce? It’s cheap, but it’s also laden with chemicals, and probably came from a corrupt field of genetically mutated garbage picked by underpaid, unappreciated workers. Produce is the first area where I plan on making the switch – and I invite you to join me. Farmers markets are popping up all over the place, and it’s a trend train that everyone should hop aboard. Get your fruits and vegetables from a local farm; this produce will be handled with love, and you’ll be able to see exactly where your money is going. Did I mention how much better local produce tastes? Plus, shopping in an open air market beats the overbearing fluorescent lights of Walmart any day. Bread and Roses Food Cooperative on Railroad Avenue – Always a favorite stop for healthy munchies, I recently discovered that Bread and Roses also carries a great supply of local produce. They are entirely volunteer-run, and offer hearty discounts for members. 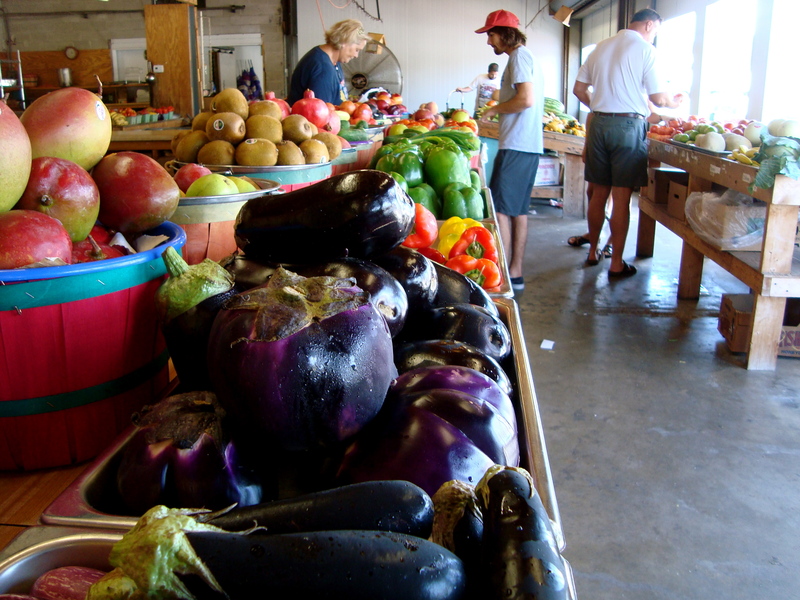 Regular food shipments arrive on Mondays, and Thursdays are their local produce day. Plus, they’re connected to the Fermentation Market – another superb local business. New Leaf Market and the Lafayette Street Organic Growers’ Market – In addition to New Leaf’s constant supply of delicious health food, every Thursday from 3 – dusk, they host the Lafayette Street Organic Growers’ Market behind The Moon. The market supplies fruits, veggies, seafood, meat, baked goods and more. New Leaf also participates in Local Business Saturdays, offering great deals for patrons supporting local establishments! 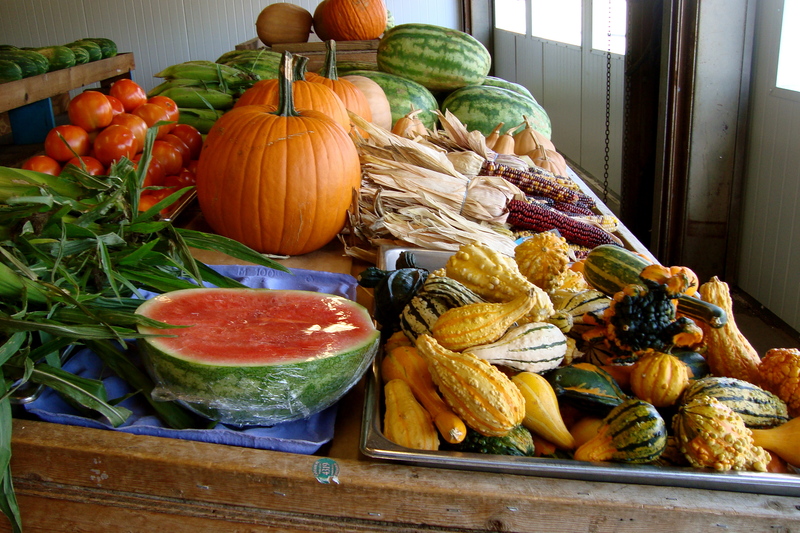 The Thomasville Farmers Market – Just a 30 minute drive to Georgia will take you to a sweet open air farmers market that comes complete with the Market Diner, which cooks up fresh food using local ingredients. Totally worth the drive, and a perfect opportunity to explore Thomasville. Check out my previous post about the market. This last one will have to be further updated in another post. While scoopin’ dinner last week with Niko at the shopping center on the corner of Apalachee Parkway and Capital Circle, we stumbled upon this newly opened produce market that appeared to be operated by a local farm. I have vowed to check it out after my Rocktown trip, and will dedicate an entire post to these guys – if it’s worthy! The plan is to start featuring loads of locally owned markets, restaurants and shops on a frequent basis. If you’ve got any suggestions for a place I should feature, let me know and I’d be glad to check it out! I hope you all join me on this journey towards fully embracing local pride! Vote to help the Southeastern Climbers Coalition purchase and restore outdoor areas in Alabama and Tennessee! In recent years, the Pepsi Refresh Project has gained notoriety for their work assisting small groups in achieving big goals. The Southeastern Climbers Coalition is vying for a chance to win $250,000 in funding to restore closed climbing areas and promote the sport of rock-climbing. Their plan is to purchase approximately 80 acres of land in Tennessee and Alabama that have been closed to public access. They also hope to create new hiking trails throughout the southeast, and maintain current trails. Climbers will be particularly interested in the efforts made to acquire land in Alabama. The 40 forested acres of land are dotted with an impressive amount of boulders and cliffs. There are more than 100 recognized boulder problems in this area, which reportedly range from V0-V12. Non-climbers will also benefit from this project, as it will promote hiking trails throughout the entire southeastern region of the United States. You can vote daily by visiting the SCC’s Official Voting Page on the Pepsi Refresh Project website. This is a great opportunity for the climbing community to do something that will greatly benefit future generations of climbers and outdoor enthusiasts of all types. It is imperative that we cherish what nature has given us, and there is no better time than now to start preserving and restoring the beautiful outdoors.